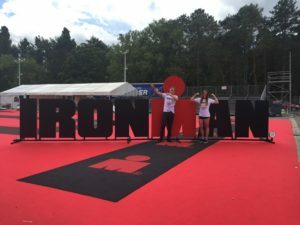 After watching my dad compete at Ironman UK three years ago, I decided I was also going to become an Ironman. 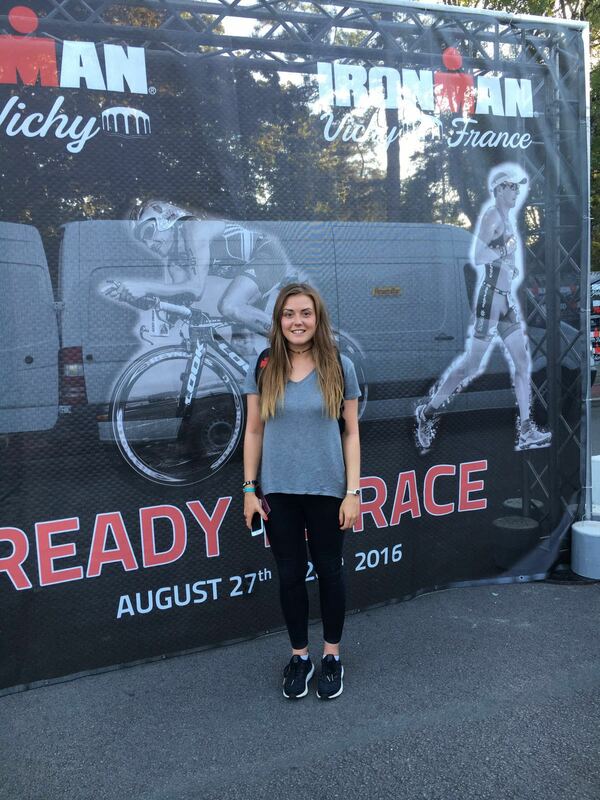 Ironman is one of those things that unless you are involved in the triathlon world, it probably means nothing to you. It meant a lot to me! After three years of building up my endurance training, I finally signed up last June for Ironman Austria. Obviously, that didn’t go to plan! 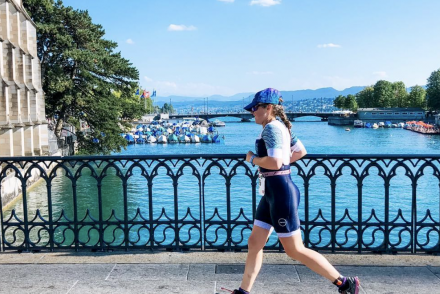 – two months out from race day I got a stress fracture in my back which literally meant race over, which is how my journey to Ironman Vichy in France came about, just two months later. Thanks to the last minute decision, every single hotel and air b and b in the area was full, which meant a hotel an hour away from the race and a very last minute flight that had us sprinting with only ten minutes to spare before the closing of the expo to register. Evidently this meant no race briefing and a lot of last minute putting bikes together (a very stressful way to spend the day before the race), and little idea of what was going on at all! – I wish I could say this wasn’t normal for the Young’s but that would definitely be lying! I didn’t get woken up by a horrible alarm at 3:30am, my boyfriend (the best support crew a girl could ask for) stopped my alarm before it went off and gently woke me up, passing me my breakfast at the same time. Race day isn’t glamorous – I ate warm overnight oats from a Tupperware box in bed that had been in a hot room all night with no aircon, and washed it down with an a electrolyte drink, I didn’t even get a coffee! 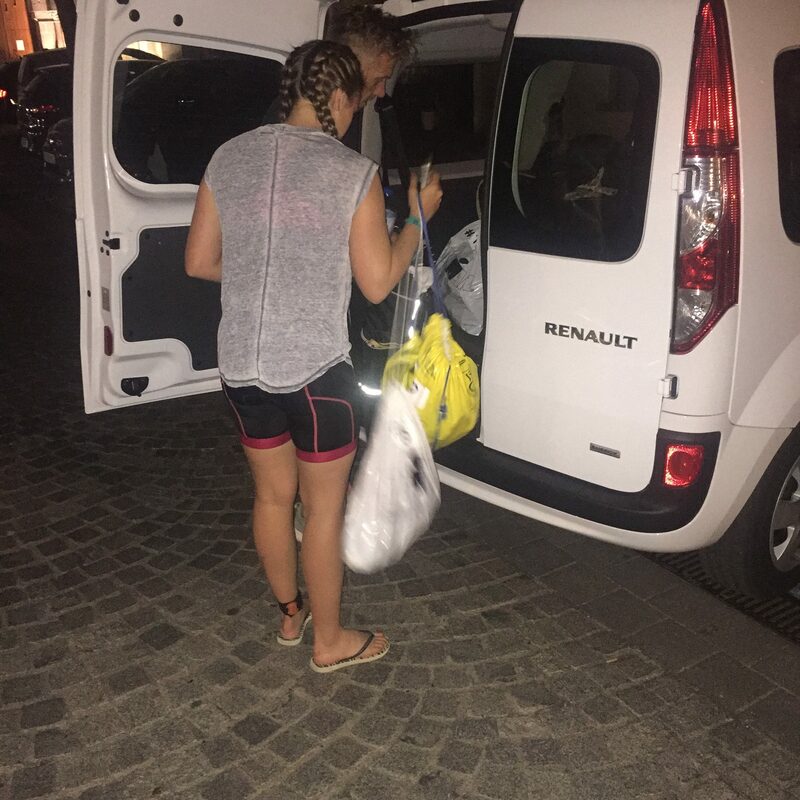 I ate and began with my race day hair braids, put on my race tattoos and tri kit before making the hour long journey to the Vichy start to fill my bike food bag with Cliff bars, set my garmin and pump up my tyres (I had my dad who was racing to do this bit). I haven’t mentioned this bit yet but…. It was none-wetsuit. Major panic! Everyone I had managed to ask who did the half distance the previous day had said it added about 15 minutes on to their normal swim time, which meant around 30 for me! This didn’t fill me with confidence as we began to shuffle through the ‘pens’ towards to start, which was literally just a rolling-jump-of-the-edge-and-go start! It had also been over 30 degrees in the previous days so I was very worried about how hot the run was going to be, and how much it might slow me down. The water really was too hot for a wetsuit, I was slightly thrown off by the jumping in start and the lack of wet-suit but I soon found my breath and began a relaxed bilateral stroke amongst the huge washing machine of people thrashing around. People had warned of a current on the way out but I didn’t notice anything, the water isn’t exactly smooth in any triathlon with the amount of people around you. The swim was all going fine until the second loop, I had to actually come out of the water and jump back in at another point, I didn’t know the course and ended up going in the complete wrong direction to find myself surrounded by kayaks with a lot of whistles being blown at me in order to get my attention, and get me in the right direction! I was VERY frustrated by this point at wasting so much time, but I got on with it and tried to relax! Before I knew it I was running out of the water and through the first transition, I looked down at my Garmin to what I thought was nearly 2 hours! 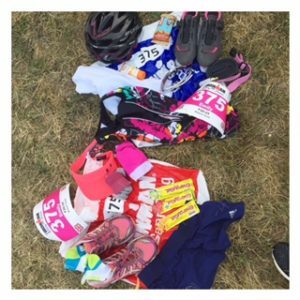 – I could have cried, my normal time is 1:20, and I hadn’t felt like I was significantly slower! I ran past my boyfriend who was spectating and shouted my time at him in frustration, he responded by saying he had tracked me in the one twenty’s, I shouted back “I hope you’re right!” in disbelief and made my way into T1. Again, I had no idea what the bike course was like, I had spoken to a few people but like I always find with these things, everyone has a different memory of what it was like! It was a two-lap course, which I was very happy about; it is definitely easier to break down in your head! – you literally are on your own for 112 miles, hours and hours and hours, it is a mental game more than anything! I was sensible with my nutrition and made sure to take a bite of my foods or half a banana every 30 minutes or so, I grabbed the high 5 energy drinks and the water and found the course to be a nice one – it was flat with a slight incline, and a few hills towards the back of the laps, we got a bit of head wind and some rain but otherwise it was a good course! I didn’t have my mileage displayed on my Garmin, just my current speed so I could be aware of my pace and if I thought I could push on. 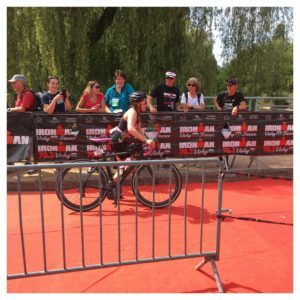 I literally couldn’t believe it when I turned around the last corner and into transition and saw I had done the bike in around 6 hours! – that is 35 minutes faster then what I did Austria in which was also very fast for me. 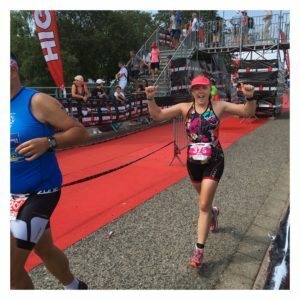 I can’t tell you how happy I felt to be on my feet – I knew at this point whatever happened I would finish, even if I had to walk it or crawl it, I was going to be an Ironman. 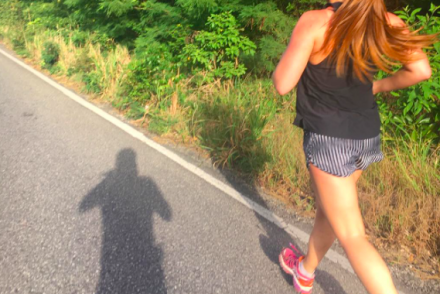 I was obviously very wary of what was going to be in store for me on the run, I had only 5 weeks run training under my belt after a four month injury, would my legs give up on me? Would my back? I started running at what I felt was a steady pace and began over taking a fair few people, despite the first 6 miles feeling like the hardest 10k I had ever run! I didn’t keep much notice of my garmin, though I did make sure to see that I had done the first 10k in under an hour, which is around where I wanted to be, at least to start with. It was a pretty flat course, but by this time the sun had really come out and it wasn’t a shaded course! It included some very long flats that I found mentally challenging, but a 4 loop course which was great to break down in my head and keep me going. The second loop was much easier than the first, and I was very sensible in getting a drink at every aid station and having the support hose me down with cold water to keep me cool, whether this added a few minutes on or not. 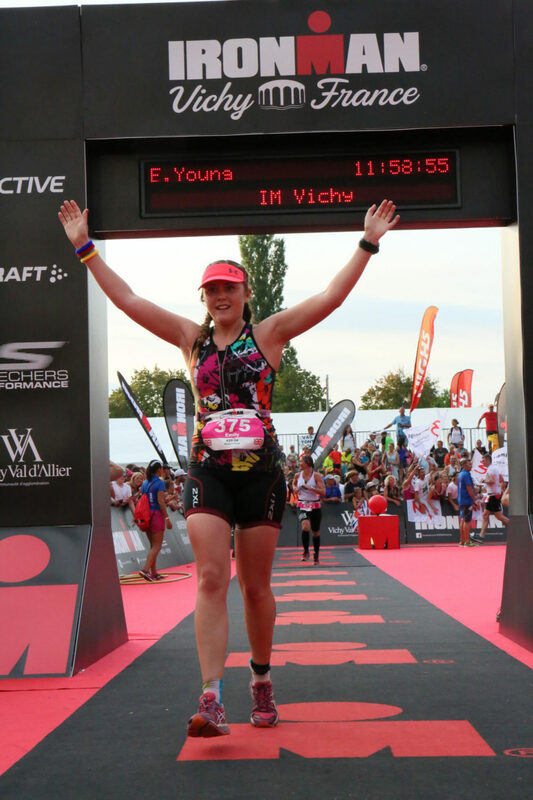 By mile 12 the trouble started, its not nice and its not pretty but that dreaded tummy that a lot of people talk about was happening to me, my main priority wasn’t getting through the next bit of the race, it was getting to the next toilet! 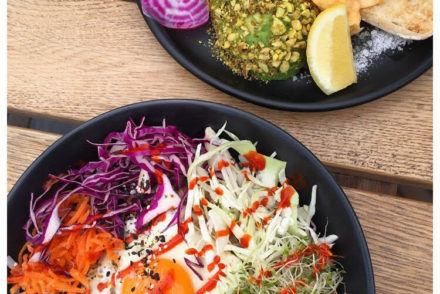 – Unfortunately despite practicing my nutrition this still affected me, and definitely added around 10-15 minutes on to my run by the time I had made four stops! 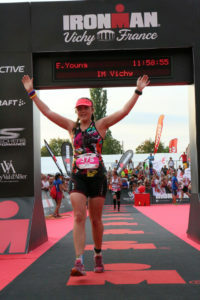 Despite this, by the time I made the last 6 mile loop I was absolutely ecstatic (and exhausted), I knew I was going to make it and after 12 months of hard work I only had about a hour of suffering to go before I hit the red carpet! I can’t even begin to explain how amazing It felt the minute I got on to that carpet and saw the finishing arch, I spotted (and heard) my mum, brother and boyfriend shouting and smiling at me, cameras at the ready. 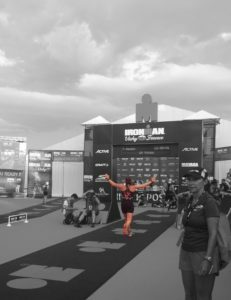 I didn’t even hear the presenter say my name over the microphone, and I didn’t look up at my finishing time, I just couldn’t believe it was done…. I am an IRONMAN. What Garmin do you use that you can take in the water with you? Creamy peanut and banana chocolate ice-cream lollies!